Using a technique that introduces tiny wrinkles into sheets of graphene, researchers from Brown University have developed new textured surfaces for culturing cells in the lab that better mimic the complex surroundings in which cells grow in the body. "We know that cells are shaped by their surroundings," said Ian Y. Wong, assistant professor of engineering and one of the study's authors. "We've shown that you can make textured environments for cell culture fairly easily using graphene." Traditionally, cell culture in the lab has been done in petri dishes and on other flat surfaces. But in the body, cells grow in considerably more complex environments. Research has shown that a cell's physical surroundings can influence its shape, physiology, and even the expression of its genes. That has led scientists in the last decade or so to look for ways of culturing cells in laboratory settings that are a bit more complex. Making surfaces with textures small enough to be relevant at the cellular scale isn't easy, however. So the Brown team turned to a darling of the nanotech world: graphene, the carbon nanomaterial. 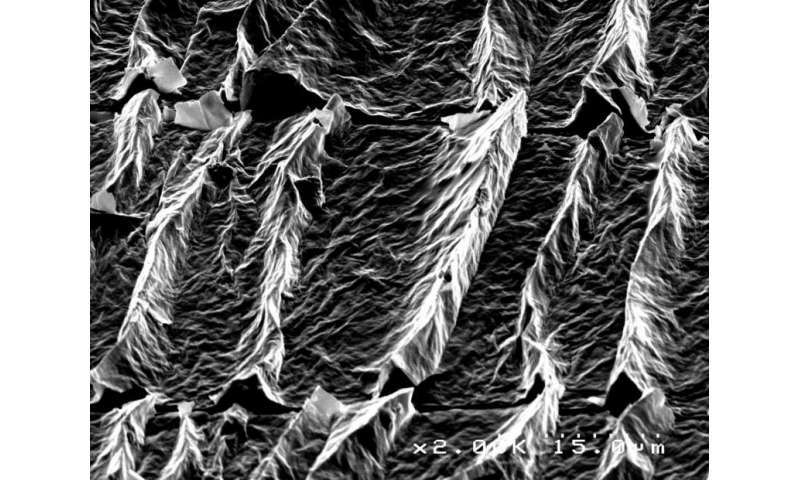 To make their textured surfaces, the researchers used graphene oxide dispersed in a solution and dabbed onto a substrate made from a rubbery silicon material. Before applying the graphene, tension is applied to the substrate to stretch it out like a rubber band. When the graphene dries, the tension is released and the substrate snaps back to its normal size. When that happens, tiny wrinkles—ridges just a few microns high and spaced a few microns apart—form in the graphene layer atop the substrate. The size of the wrinkles can be controlled by the concentration of the graphene solution and the extent of the substrate stretching. A more concentrated solution increases the spacing between the wrinkle ridges. More stretching increases the height of the wrinkles. Part of the beauty of these surfaces is the ease with which they can be made, says Mehrdad Kiani, a Brown undergraduate student and member of the research team. "Other methods are much more labor-intensive," Kiani said. "With this method, you can take a long piece of rubber substrate, stretch it out, and place many droplets at once." The long ribbon can then be cut into small rectangles, which can be placed in multiwell plates for lab experiments. Once they had their wrinkled surfaces, the researchers' next step was to see whether those wrinkles influenced the growth of cells cultured on the surfaces. 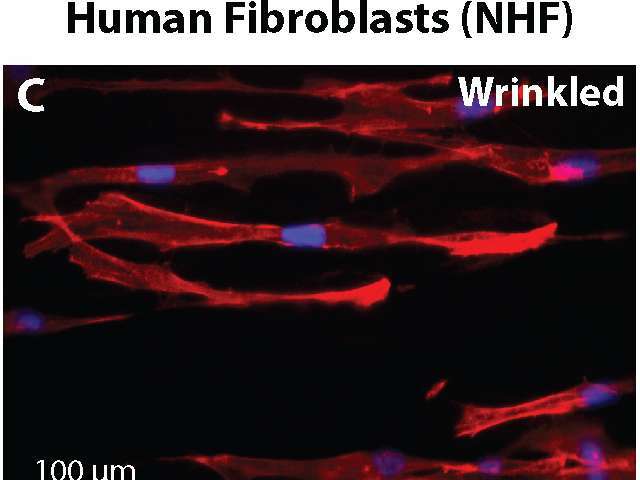 In a study published recently in the journal Carbon, the team grew human and mouse fibroblast cells (cells involved in wound healing) on flat graphene sheets and on wrinkled ones. The study revealed major differences in how cells grew on each of the surfaces. "On the flat graphene, the cells were disorganized, multipolar and not aligned," said Evelyn Kendall Williams, another undergraduate member of the research team. "But on the wrinkled surface, the cells were elongated and highly aligned along the wrinkles. These morphological features are more indicative of a biologically relevant phenotype." In the body, fibroblasts grow in the nooks and crannies of connective tissue. They tend to tend to have a long, spindly appearance similar to the look of the cells that grew in the graphene wrinkles. Having shown that their wrinkled surface can influence the shape of cells, the researchers will continue to do experiments with wrinkles of different shapes and sizes. These surfaces make that possible because the wrinkles themselves are easily tunable. "We think this is a great new way to understand how cells' growth is influenced by their physical surroundings," Wong said. The surfaces could also be used to test drugs in the lab, Wong says, or perhaps as biomimetic surfaces for implantable tissue scaffolds or neural implants. The work was the result of collaboration between Wong's biomedical engineering lab and the lab of Robert Hurt, professor of engineering at Brown, who focuses on carbon nanomaterials. "This is a new application for graphene," Hurt said. "We are just beginning to realize all of the innovative ways one can use this atomically thin and flexible building block to make new materials and devices." Sounds like a good way to fabricate stretchable graphene for electrical use also, like bendable electrodes. Maybe they have also tested it with x + y stretch. That should have ridges going in two ways.